Just wanted to let you know I love your blog and personal style. Super cute. Work it out diva. Loving the hair. that bright blue trench coat is stunning better work that coat! I thought the outfit was super cute, then I saw that blue and mustard together!! It is a fantastic color combo!! Very pretty! Love the hair styling. Rest is just clothes, comments from your smart aleck neighborhood enginerd. It was great seeing you last week. LOL, Thanks Brian!! It was great seeing you and Michelle as well. I miss those smart aleck comments and busting Joel's chops about his Cowboys! the outfit is HOT! lovin it! Love your hair !! pretty skirt and heels ! Love this entire look and that hair is rocking. Very Nice look. 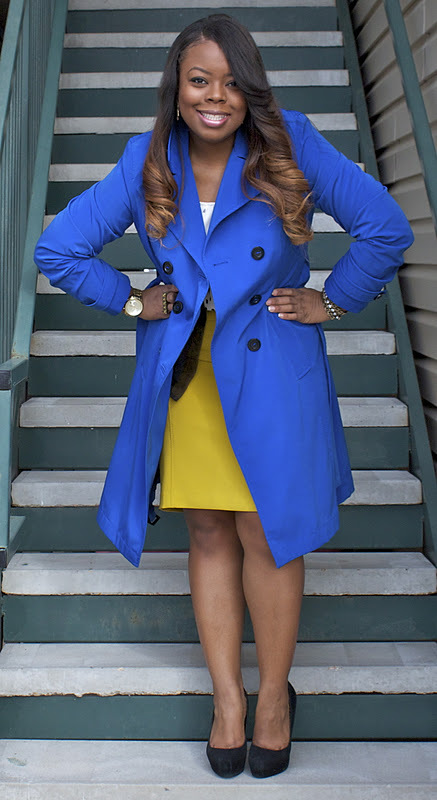 The mustard skirt is gorgeous and pairing it with the blue trench was genius! I hope you get to go to Fashion Week. I would like to attend the event in the Fall. I'm really feeling your hair. It looks so perfect in the first picture. I love me some mustard! You look great! I love your hair color. I must give it a try soon! I love that blue trench! fashioninsomnia.blogspot.com If you like follow! My everyday BEAT FACE routine!